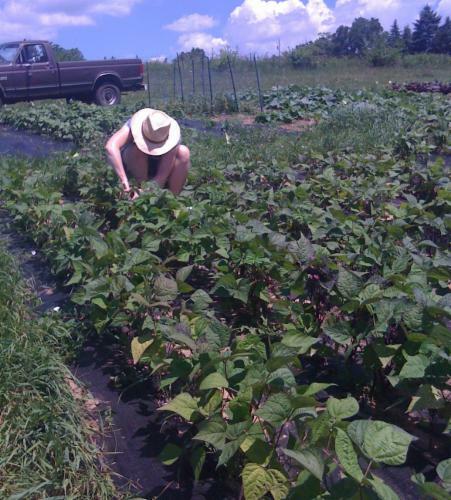 With one year under our belt, we were anxious to make Garden 2010 bigger and better. As spring approached, Gary organized the planting weekend for May 13-17, 2010. We are so fortunate to have a great crew of wonderful friends who are willing to share their time. Without their help, this wouldn’t be possible. The fantastic 2010 crew included; Chris, Gary, Ross, Shad, Sean and Warren. In the weeks leading up to planting weekend, Pat and Annette didn’t know what was going to be coming next as the UPS truck seemed to come nearly every day delivering seeds, landscape material, and tools. After arriving in Monroe at midnight on Thursday, work began on Friday morning with lessons on how to drive the tractor and cut the grass with the windrower. Much preparation was done to mark locations and prepare planting sites. After laying down the weed barrier, the planting began. Garden 2010 consisted of sunflowers (Chris’ favorite), corn, tomatoes, lettuce, beets, carrots, gourds, cantelopes, watermelon, peas (yum! ), peppers, beans (yellow, green and purple), yellow squash, zucchini, pumpkin, and cucumbers. There was time for fun too! The guys enjoyed dining at the fine restaurants in Monroe, a BBQ chicken cookout, and the wonderful New Glarus Brewery beers. If you enjoy a cold beer, don’t leave without trying one or two. Note: The Wind stops after the first 30 seconds in this video. After a whirlwind spring spent preparing for summer, we finally departed Colorado Springs with eagerness to get to the garden. Once again, we immediately went to the garden and were delighted to find that everything was up and growing when we arrived. We fell into a routine of heading to the garden in the early morning hours to weed and replant especially the corn after the crows stole the seed out of the ground. Thanks much to Lin who had many many many tomato, pepper and corn plants started for us. Pat had tomatoes as well as super spicy peppers started for us too. Summer heat and humidity started in quickly and we found ourselves sweating at the slightest movement. It became the norm to be dripping. Melissa wore her hat all summer. One of the funniest moments of the summer was when Gus the dog grabbed her hat and took off running with it. He ran even though the hat covered his whole face and he couldn’t possibly see a thing. Gary and Melissa gutted through a hot Saturday morning building an absolutely fantastic firepit with views of the rolling hills of southern Wisconsin. Thanks so much Gary for picking the perfect place. It is my absolute favorite spot on the whole farm. Early in June, Cecily’s pigs arrived via Volvo station wagon. Definitely scared that farmer. He didn’t think we knew how to take care of his precious little piggies. We showed him…the pigs thrived. 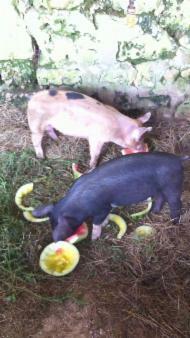 Listening to pigs eat watermelon is something that everyone should have the pleasure of experiencing. They are definitely in the moment enjoying the experience. Faline and Dexter, the Toggenburg goats arrived after staying with their foster parents (Jamie, Deanne and Sami). We were delighted to find that dairy goats make wonderful companions. They bond strongly with their people and enjoy taking walks. It is hard to be sad in the company of goats. They are just too happy and share it with us. The garden absolutely went crazy with all the heat and humidity. These are ideal conditions for plants, although it is exhausting for us. Rain continued through June. Our donations began with snow peas in mid-June. It was so hard to give those yummy peas away. They were absolutely delicious. Slade enjoyed eating them straight out of the garden. Next year we need more of these sweet treats. We learned that the gourds must be banished to the back 40. They are an incredibly prolific plant with gorgeous crisp brand new white blooms each evening. Gourd blooms are a wonder of nature, even though they totally buried the cantaloupe plants. Thankfully, this didn’t seem to bother the cantaloupes at all. The local food pantry distributes food on Monday afternoon. To ensure our produce is fresh on Mondays, we settled into a routine of harvesting on Saturdays, Sundays and Monday mornings. We used Pat and Annette’s basement for storage because the cool and humid conditions kept the produce well until Monday morning. For three weeks of July, no rain fell which required us to bring water up from the creek. Gary’s parents joined in the fun even though it was painfully hot riding in the back of the truck. Despite the stress of the drought, the plants bounced right back as soon as rain fell again. In preparation for next year, we continued to bring organic materials (in other words, manure/poop) from the pigs, goats and the barn. Gary and Pat worked for several weeks to construct our mobile chicken coop that keeps the chickens in the garden and allows them to deposit their manure directly on the garden (Not on the current plants, but for areas to be planted next year). We will strategically plant next year’s plantings to correspond with these locations. The summer wouldn’t have been the same without our continuous stream of visitors (Kings, Gary’s parents, Tanabe’s, Erica and the boys, Laura/Slade, Tina). Each brought us encouragement, laughter and the opportunity to take them to Pancho and Lefty’s. Those nachos are to die for. Thanks to all of you who came and shared time with us. We enjoyed sharing our summer with you. Please come visit again. We left for Colorado Springs on August 15th just in time to get the kids back for school. As we left, the huge pumpkins we planted looked like they had reached 75 pounds each already. We are anxious to see how big they get. At the time we left, donations totaled 1,000 pounds of produce. 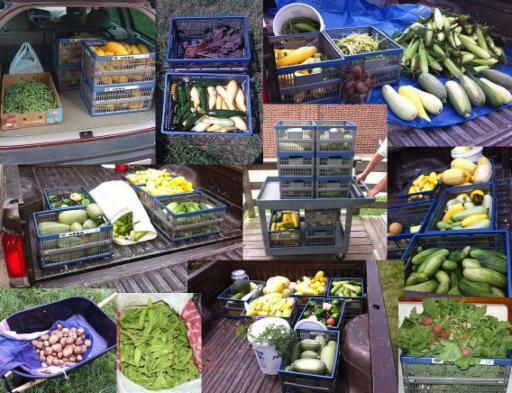 Many thanks go to Pat who has continued to harvest and donate even more, bringing our total close to 1,700 pounds. This is a 550% increase over last year. We couldn’t do this without the help of everyone who contributes throughout the year to help with planting, harvesting, and encouragement. We are so grateful for the support.